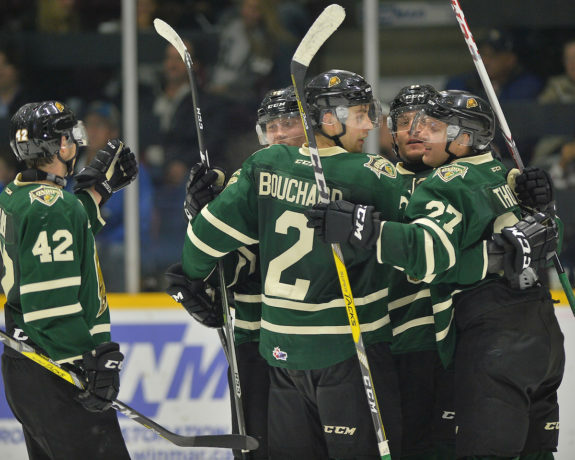 Evan Bouchard: Among the London Knights' Best? 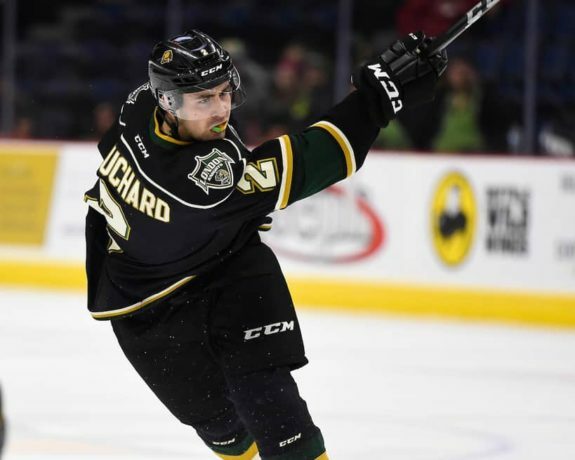 Evan Bouchard: Among the Knights’ Best? With the London Knights already in the midst of a tear, the division-leading Kitchener Rangers came to town on Feb. 16, ready to show the Knights just what a playoff team looks like. Instead, the Rangers skated off on the heels of a 6-2 loss to the Knights with the headlines focused on the NHL draft-eligible captain of the winning team – Evan Bouchard. Set aside the fact that he leads the team in scoring this season and you can even ignore the fact that he’s ranked among the top-tiered players in the draft. With his two-goal performance against the Rangers, Bouchard found himself among some big names in Knights history and on route to solidifying himself as one of the best defensemen to don the team’s colours. With his team up 3-2 on the Rangers in the third period of Friday’s game, Bouchard jumped up into the play and went straight to the net. One of the newest members of the team – Connor McMichael – saw the big blueliner streaking to the net and threaded a perfect pass through the defenders. Bouchard got enough of it for his 19th goal of the season. Just six minutes later – with the Knights up 5-2 – Bouchard fired a backhanded clearing attempt out of the Knights zone and found the empty net at the other end of the ice. The goal was his 20th of the season which put him among elite company when it comes to the Knights franchise. With the tally, Bouchard became just the seventh defenceman in team history to notch a 20-goal season and it’s just the 10th time a blueliner has achieved the feat for the Knights. His 20th ties him with Dennis Wideman’s 2002-03 season total for ninth on the list, but Bouchard has 12 games remaining in the season. Considering he’s averaging 0.36 goals per game, his numbers dictate that the 18-year-old should tally another four goals which would tie him for the fourth best total in one season for a Knights defenceman (with Dennis Wideman’s 2003-04 campaign). But Bouchard’s accomplishments this season don’t stop there. Along with scoring his 20th of the season, Bouchard delivered an assist on Friday against the Rangers before tallying another on Saturday in Erie. With the assist against the Otters, Bouchard’s season total is up to 71 points in 55 games. Aside from being 13th overall in the OHL in scoring this year, Bouchard’s totals are good enough to make him the highest scoring defenceman in the league this year. On top of that, the projected first-round NHL pick has tallied 132 points to date over his OHL career with the Knights. That ties him for eighth on the franchise’s all-time scoring list for defensemen with Don Martin. Martin was a member of the Knights from 1985 to 1988 and tallied 56 goals and 76 assists over 175 regular season games with the franchise. While Bouchard was able to accumulate the same number of points in nine fewer games, chances are he won’t stay in that spot on the list for much longer. With 12 games left this year, and averaging 1.29 points per game, Bouchard could add to his totals with another 15 points. That would leave him with 147 for his Knights career which would be good enough to pass Martin and Bob Goodish (142 career points from 1977-81) for seventh on the Knights’ list. He also sits 89th on the franchise’s all-time list for points – just five shy of passing Paul Nicholson for 87th all-time. But if individual stats are what you’re interested in, something tells me that Bouchard isn’t interested in just talking about his own accomplishments. In fact, to get that ‘C’ on his jersey, Bouchard is likely focused on helping his go down in league history.